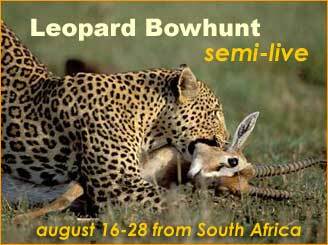 Join Pat Lefemine as he bowhunts leopard in South Africa with Dries Visser Safaris! The aroma of the Africa bush brought back fond memories for me. It was good to be back. Eleven years ago my wife Julie and I had made our one and only trip to Zimbabwe to bowhunt on our honeymoon. I left Africa knowing that some day I would be back. I never imagined it would be for leopard. After soaking up the strong South African sun and getting acquainted with the many lovely people who worked at Dries Visser Safaris I pulled out my two bows. My leopard bow would be a Bowtech Justice VFT set at 60 lbs. and shooting carbon arrows tipped with Muzzy 125's. My recurve was my trusty Black Widow X bow set at 64lbs and shooting carbon arrows and a Wensel Woodsmen head. 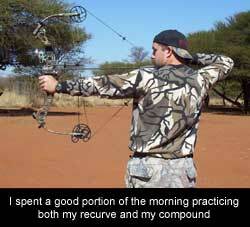 I must truthfully admit that my practice sessions prior to Africa were predominantly with the Bowtech since the shot on a leopard was so critical and I had not shot a compound for over 15 years. My shooting accuracy bore this out. Switching bows was confusing and terrible for my traditional form. So I decided to use the compound until I got my cat, and then spend a couple days stump shooting and honing my bare bow shooting till I was comfortable bowhunting at close range. If Dries' other leopard hunts were any indication, my leopard hunt would be over quick and I'd have over a week to hunt plains game with my Black Widow. Once I was done organizing my gear, and shooting both my recurve and compound at the practice range, it was time to go and set our first bait. Dries Visser Jr. would be my Professional Hunter (PH) and his tracker, Ben, would be with me at all times. After a great lunch, Ben pulled up the Toyota pickup - loaded with a bucket of guts and the hindquarter of a freshly killed donkey - and we headed to our first property to bait. It took an our to reach the Mountain property for our first bait. I helped where I could but the smart thing to do was to step out of the way and let the experts do their thing. Dries and Ben first checked for tracks. I have no idea how they found the tracks they did. 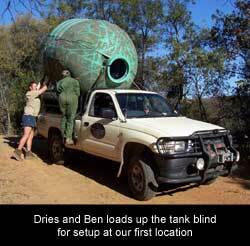 Ben and Dries could spot a leopard track in soft sand while driving the Toyota. Even after we got out of the truck and they pointed out the pad and 4 toes, I still had no idea what I was looking at. 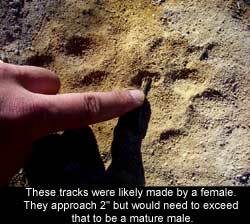 They found a relatively fresh track which was likely made by a female leopard. Dries uses a small stick or plant stem to measure the horizontal width of the pad. If it's 2.25" or better - it's a good mature male. If it's up to 2" but no larger, it is a small male or female. A 2.5" track is a BIG male - and that is what we're after. We moved a tank blind (made up of an old water tank and modified for leopard hunting) into the area where Dries felt a leopard would likely hit. For the next two hours Dries and Ben (and me occasionally) would cut branches, hang bait and check out tracks. It took a couple hours of hard work - most of it 15' up in a tree - before we were ready to head back home. That night I was treated to a delicious meal. And I had an opportunity to spend time with my friend Gene Wensel, who was wrapping up nearly a month of bowhunting. I also had the opportunity to meet some of the other bowhunters in camp. There were three guys from Arizona, Tom, and his sons Tom Jr. and Robert. We told stories (mostly Gene) over beers in the main lodge and we listened to hunting stories fresh from the field. But my favorite story was when Gene told us how he had grabbed toothpaste instead of jock itch cream in the middle of the night - from his description it sounded like something I'd rather hear about than experience myself. After our visiting was over it was down to business. Dries and I headed to the range for the first of many night shooting practice sessions. It was evident before, but it was even more evident now - I would have one opportunity at a leopard - and there was a lot at stake. My shooting that evening was OK, nothing terrific but certainly not embarrassing. I went to bed that night to the sounds of jackals off in the distance and the unmistakable sound of zebra's vocalizing their presence. 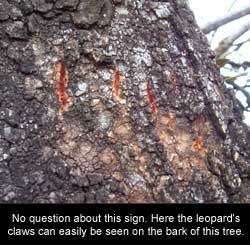 My reason for being here was the leopard. While Dries has a fantastic amount of plains game (judging by the stories and the heads returning from the field) I was only interested in a couple of species: mainly a zebra and a gemsbok. I wanted to experience and participate in the entire leopard hunt, including baiting, checking the baits and building the blinds. This was important to me. As time permits, and where it makes sense, I plan on doing some plains game bowhunting as well. So while you are likely to experience a fair amount of plains game hunting during the next 13 days, this hunt will primarily be about the leopard.